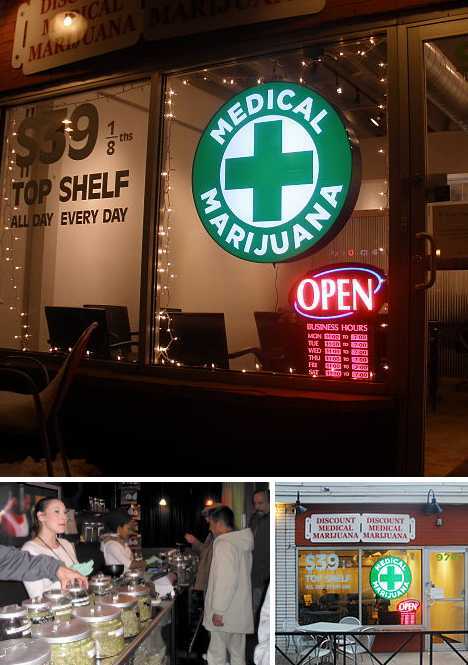 Medical marijuana dispensaries, compassion centers and “cannabis clubs” have sprung up like, er, weeds over the past several decades complementary to laws allowing for the legal use of marijuana for medicinal purposes. 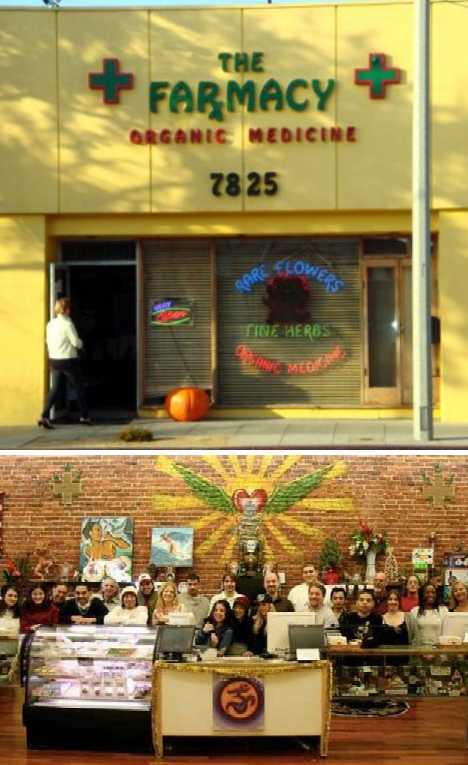 These New Age drug stores exhibit a wide range of architectural, decorative and visually unique storefront styles reflecting the confusing legal status of marijuana itself. 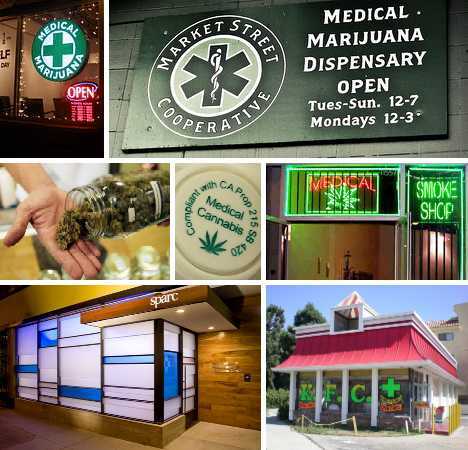 Did you know that as of July 2011, there were more medical marijuana dispensaries in Denver than Starbucks coffee outlets? This is perfect for any patients that need to get their hands on medical marijuana to help with any ailments they are suffering from. Seeing as this is to do with health, this should be your number one priority. But it does mean it can be quite pricey, especially with continued use. But thanks to companies like SaveOnCannabis, you can find discounts and coupons online to save some money, which is always a bonus. Over 125,000 Colorado residents have been prescribed medical marijuana and they can choose from nearly 300 locations providing the ethereal herb. 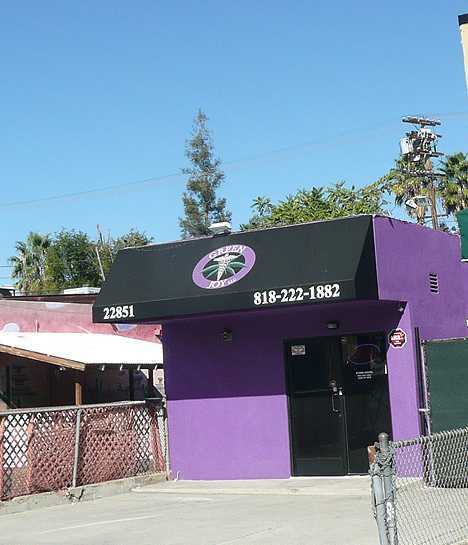 Here’s one fine example: the Discount Medical Marijuana cannabis shop at 970 (perhaps 420 was already occupied) Lincoln Street. Erich Pearson is a man with a mission: to “bring medical cannabis out of the shadows and into the light; helping patients feel good about the place they get their cannabis is key to that.” Larissa Sand of San Francisco-based Sand Studios agreed with Pearson, noting that “patients requiring medical marijuana are forced to acquire it in poorly designed, dingy spaces,” imbuing the entire concept with a pejorative tone. The result was the “Apple store of pot,” a well-lit space that garnered the 2011 Design Award from AIA-SF (American Institute of Architects, San Francisco Chapter). 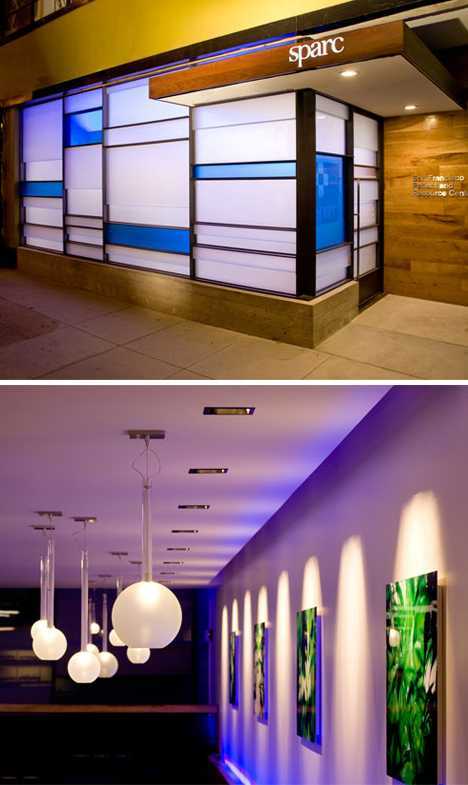 Melding the charm of an old-fashioned apothecary shop with the cool ambiance of a wine bar, SPARC’s innovative dispensary features a tinted glass front facade whose mix of white and blue panes echoes a graphic representation of the marijuana plant’s DNA. Canada, like the USA, is also displaying grudging acceptance of medical marijuana and the need for legally authorized providers. 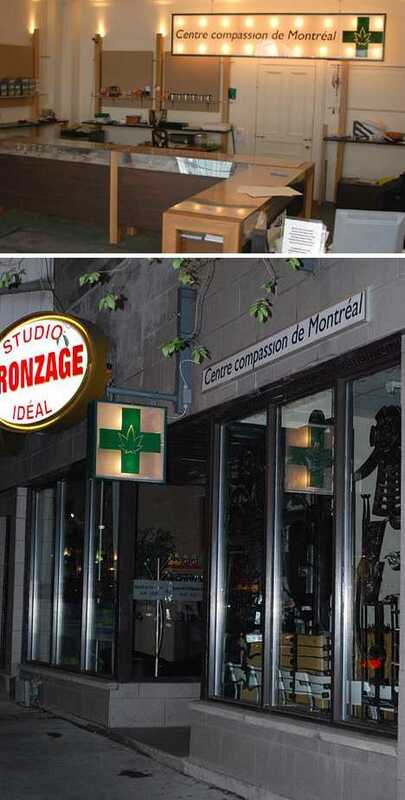 Le Centre Compassion de Montréal provides patients with their prescribed medication in a low-key, spartan, “clinical” environment. The Centre has been a “Dispensaire de Cannabis Médical” (no translation required, n’est pas?) since 1999. We doubt the late Col. Harlan Sanders counted cannabis among the 11 Secret Herbs And Spices in Kentucky Fried Chicken’s original recipe but hey, maybe that’s why it’s a secret. 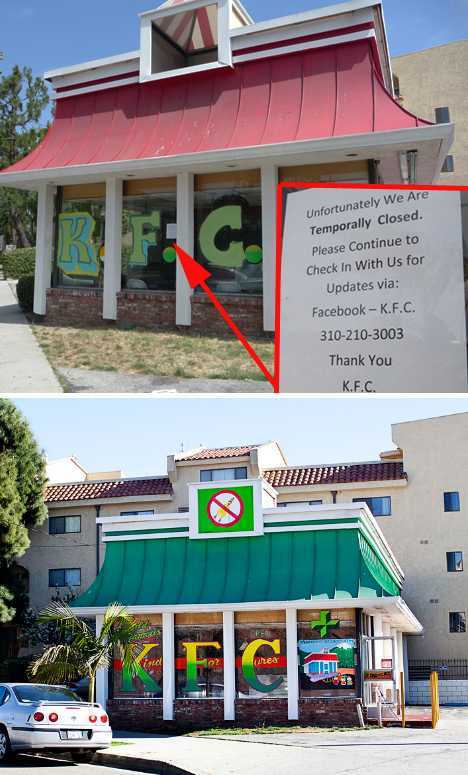 What’s plainly obvious is the heritage of Kind For Cures (the OTHER KFC), a medical marijuana dispensary located on Hughes Ave. in the Palms community of West Los Angeles. Pity they didn’t continue to sell fried chicken at the outlet, customers would buy it by the bucketload. 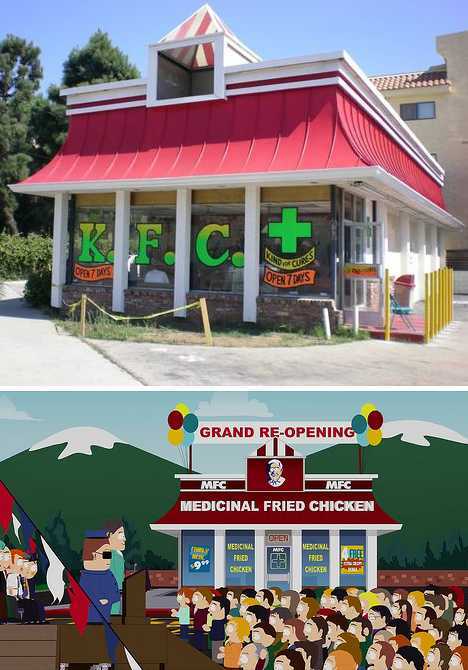 Kind For Cures was seemingly the inspiration for an episode of South Park, who re-named their re-imagining of the dispensary “Medicinal Fried Chicken.” The real KFC may have been annoyed by any perceived association with the other KFC so after being shut down for a time (“temporally”, to quote), the owners re-opened under a leaner, greener storefront. Guess they were… chicken. Clean & classy best described the Market Street Cooperative, formerly located at 1884 Market Street in San Francisco. We say “formerly” because one of the oldest medical marijuana dispensaries in the city was forced to close in January of 2012, a victim of the federal Department of Justice’s crackdown on landlords who rent to dispensaries. Seems rather a sneaky way for a “justice” department to operate, amiright? 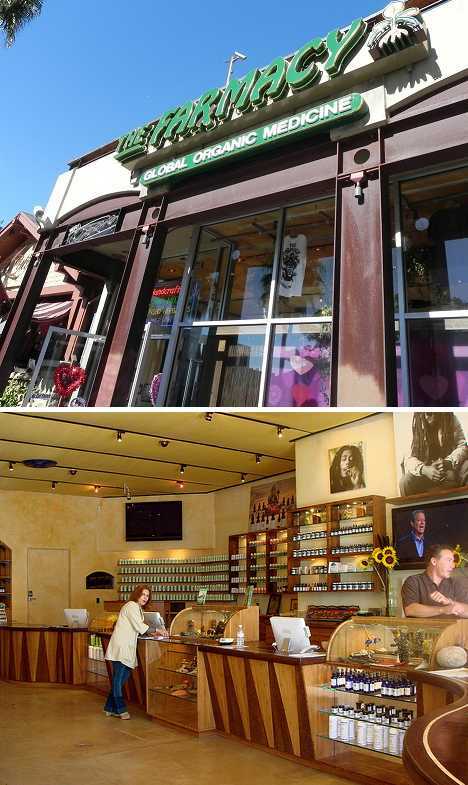 You can’t accuse medical marijuana dispensaries of going Hollywood when… scratch that, they’ve totally gone Hollywood. At least The Farmacy has, by virtue of its Santa Monica Blvd. address and warm SoCal style. 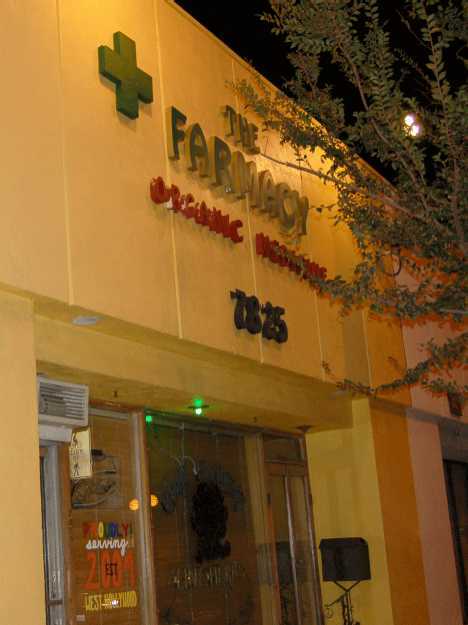 One of four officially sanctioned dispensaries in West Hollywood, The Farmacy supplies reefer gladness with no Bogarting allowed. Robbing a medical marijuana dispensary? Bad. Stealing cellphones with GPS software installed from said dispensary? Buzzkill. A trio of criminals unfamiliar with modern technology committed both sins last December at the Farmacy in West Hollywood but not to worry, some tech-savvy law enforcement officers cracked the case pronto – no word if several containers of marijuana stolen from the Farmacy were returned along with the purloined cash and cellphones. 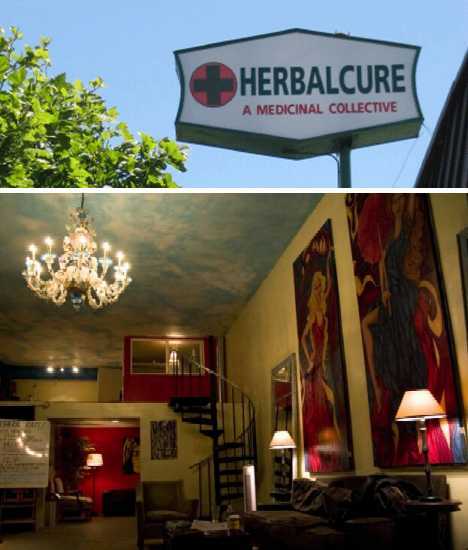 Herbalcure, located in West Los Angeles, is a “stealth dispensary” if there ever was. 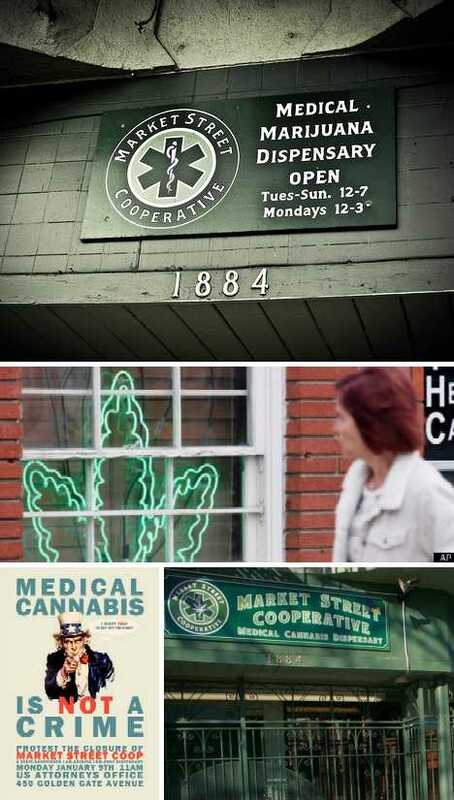 The medicinal collective is advertised by signage right out of the pot-paranoid Fifties – it would look right at home over a gas station. 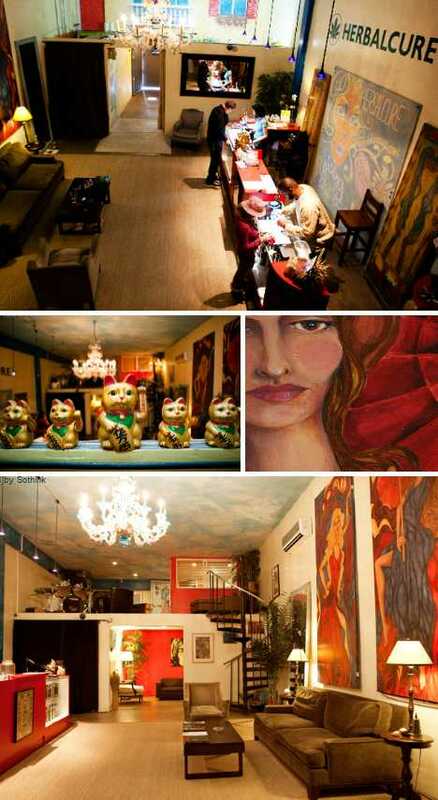 Inside things take a psychedelic twist accented by oversized paintings, crystal chandeliers and a small army of gold-toned waving maneki-neko cat statues… and you haven’t even sampled da moichendise yet. Flip the lid on Herbalcure Corporation and you’ll find an endeavor that’s striving to play by the rules set out by the City of Los Angeles and the State of California – their website spells out the many laws and regulations they pledge to abide by. Got an original copy of your doctor’s letter of recommendation and government-issued identification? Bring ’em in and become a member of the Herbalcure collective… resistance is futile, dude. Two years after then-Gov. Jon Corzine signed New Jersey’s medical marijuana law, the Garden State’s first medical marijuana dispensary is about to open… well, almost. The Greenleaf Compassion Center in Montclair just needs to pass a couple more official inspections before the store’s “budtender” (no, we did not make that up) settles in behind the counter. 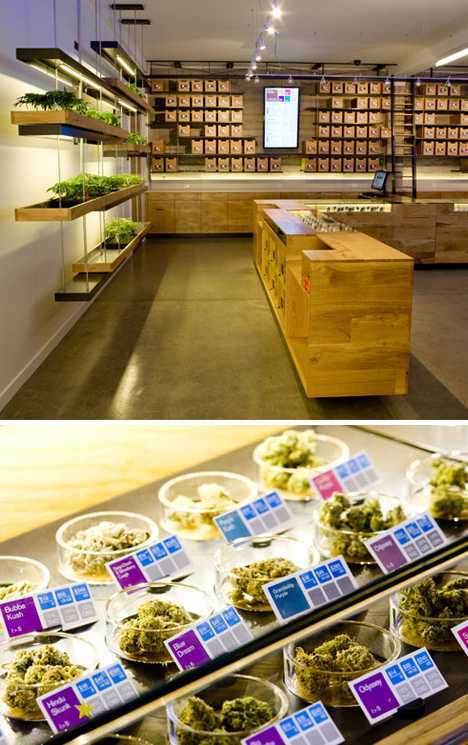 Just as in the future all restaurants will be Taco Bell, someday all medical marijuana dispensaries will look like The Farmacy’s squeaky-clean store in Venice, California. Sleek and businesslike on the outside, that is, and all woody, warm & fuzzy on the inside. 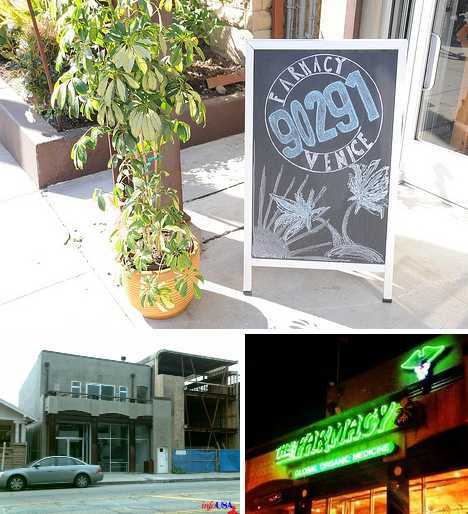 The Farmacy does herb & renewal in style… that is, Los Angeles’ oldest medical cannabis collective dispenses herb and coincidentally have helped renew a bleak stretch of Abbot Kinney Blvd. in Venice. 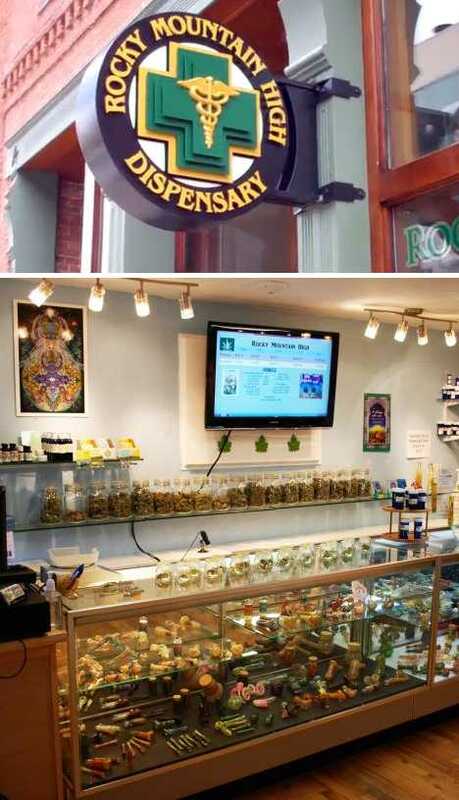 New stores and businesses around the dispensary have opened and existing ones are thriving. 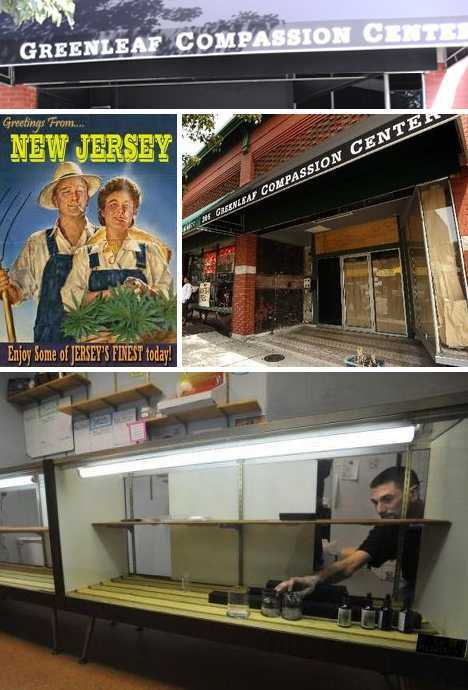 Could one say the same if The Farmacy was a liquor store or a methadone clinic? Green Joy or green menace? Medical marijuana dispensaries in the United States exist in a murky legal limbo that leaves those in need of medicinal cannabis in the lurch. The conflict goes beyond an individual’s presumed right to select his or her own recreational drugs of choice in a safe and dignified setting. It may be that the chill wind of intolerance someday sweeps medical marijuana dispensaries off the map entirely… gone, one might say, like a puff of smoke.